Last year we took a look at farm debt delinquencies and concluded that, based on data through the end of 2014, a farm debt repayment issue had not surfaced. Given the early indications that aggregate net farm income would fall in 2015, we noted this would be an important measure to watch moving forward. As expected, 2015 was a financially painful year for producers as the USDA reported net farm income across the entire country fell 38%. The drop from 2013 through 2015 was more than 55%. These large, rapid declines may leave some producers in a tight financial spot, especially when it comes to fulfilling debt obligations. Thankfully, the Kansas City Federal Reserve Bank does a great job of monitoring this and publishes data about farm debt delinquencies in the Ag Finance Databook. This week, we revisit the latest farm debt delinquencies data and evaluate conditions through the end of 2015. Data published by the Kansas City Fed splits farm debts into two categories, farm non-real estate and farm real estate. In figure 1 the share of total farm non-real estate loans reported as delinquent is shown. These data are the fourth-quarter results of the respective year; this was done to eliminate the distracting seasonal nature of the data. Consistent with last year’s conclusion, the share of non-real estate loans that are delinquent remain near historic lows. The fourth-quarter of 2015 was the second lowest in more than 29 years of data. Furthermore, at a delinquency rate of 0.98%, the latest data are well below the long-term average delinquency rate of 2.32%. It is important to note that delinquencies in the fourth-quarter of 2015 (0.98%) were up from 2014 (0.72%). In our opinion, this increase is not cause for concern as the annual increase (up 0.26 percentage points) is not out of line from a historical perspective. Larger percentage point increases in delinquency rates were observed in 1996 (up 0.37 percentage points), 2001 (up 0.59 percentage points), and 2009 (up 1.67 percentage points). In fact, given the historically low level and sharp net farm income contraction, large percentage point increases in delinquencies are not out of the realm of possibilities in our opinion. Another consideration is the volume of loans that are delinquent. The volume, in billions of dollars, of the delinquent farm non-real estate loans is shown in figure 2 (It is important to note these data are for the fourth-quarter of the respective year and are reported in nominal values, or not adjusted for inflation). Think of figure 1 as the share of loans delinquent and figure 2 as the size (value) of all these delinquent loans. In the fourth-quarter of 2015, the volume (value) of delinquent farm non-real estate loans was higher than in 2014, $760 million compared to $530 million. While these are large values on the surface, it’s important to remember these are fairly small in relation to the overall total of $77.3 billion in total farm non-real estate debt held by insured commercial banks. Furthermore, current levels are considerably below the recent high-water levels of $1.84 billion in delinquent farm non-real estate loans from 2009. Figure 2. Volume of Total Farm Non-Real Estate Loans Delinquent – Debts Held by Insured Commercial Banks, Billions of Dollars. Data Source: Kansas City Federal Reserve, Ag Finance Databook. 4th Quarter, 2006 -2015. The share of delinquent farm real estate loans reported by the Kansas City Fed is shown in Figure 3. In the fourth-quarter of 2015, the reported delinquency rate on these loans was 1.42%. This is lower than what was observed in the same quarter of 2014 (1.45%) and considerably lower than the 24 year average for the fourth-quarter (2.3%). 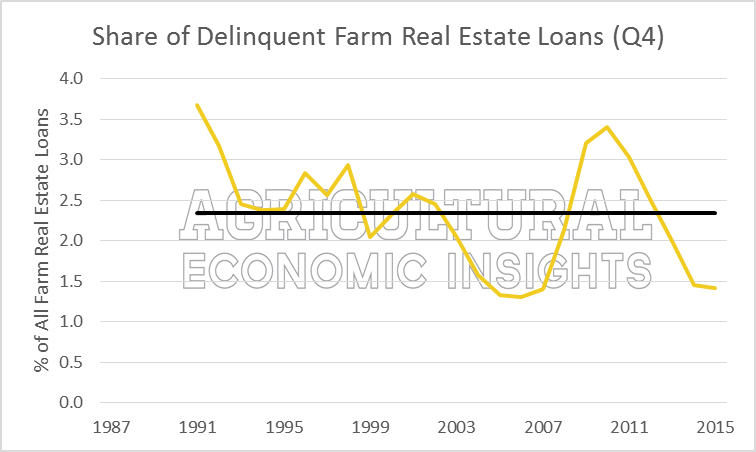 Considering the historic data, delinquent farm real estate loans were highest in the early 1990s, at the start of the data collection and wind-down of the farm financial crisis of the 1980s (Delinquencies were much, much higher in the 1980s, but the data are not included). In 1991 and 1992 delinquency rates were 3.7% and 3.2% respectively. Delinquency rates also reached high levels in 2009 and 2010 at 3.2% and 3.4%. The lowest reported rates for the fourth-quarter were 1.3% in 2006. Figure 3. Share of Total Farm Real Estate Loans Delinquent – Debts Held by Insured Commercial Banks. Data Source: Kansas City Federal Reserve, Ag Finance Databook. 4th Quarter, 1991-2015. Mean: 2.34%. In figure 4, the volume (or value) of delinquent farm real estate loans held by insured commercial banks is shown from 2006 to 2015 (just as in Figure 2, these data are for the fourth-quarter of the respective year and are reported in nominal values, or not adjusted for inflation). 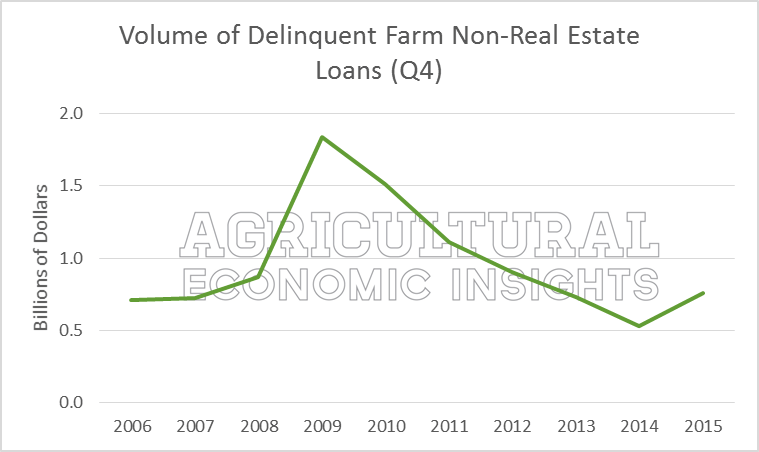 In 2015, the volume of delinquent farm real estate loans was $1.25 billion. This was up from $1.18 billion reported in the same quarter of 2014. So while the share of total farm real estate loans that are delinquent dropped from 2014 to 2015, the volume (or value) of delinquent loans increased. It’s also important to keep in mind that the latest data (Q4 of 2015) reports delinquency volumes considerably less than values reported just a few years ago. In the fourth-quarters of 2009, 2010 and 2011 the volume of farm real estate delinquencies was more than $2 billion in each year. Figure 4. Volume of Total Farm Real Estate Loans Delinquent – Debts Held by Insured Commercial Banks, Billions of Dollars. Data Source: Kansas City Federal Reserve, Ag Finance Databook. 4th Quarter, 2006 -2015. In short, the latest conditions, as reported through the fourth-quarter of 2015, lead us to a similar conclusion as last year. So far, the share of total farm loans reported as delinquent has remained steadily near historic lows. Current delinquency rates for farm non-real estate and farm real estate loans are currently well below the long-run average values. 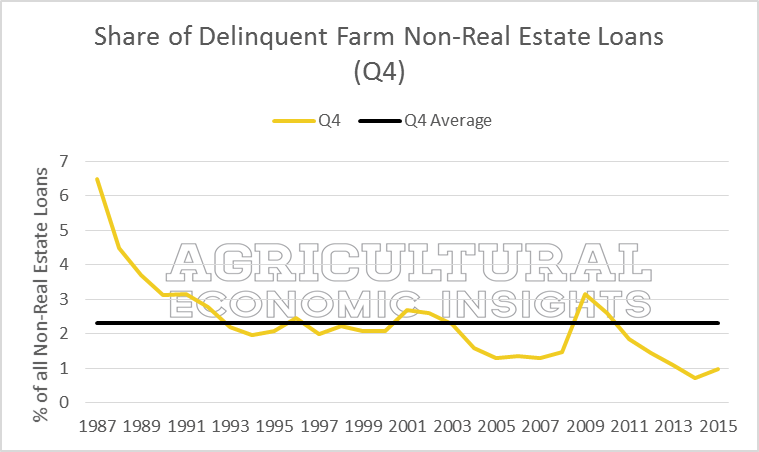 When measuring farm delinquencies by volume (or value), it’s worth noting that the latest data are considerably lower than levels observed as recently as 2009 and 2010 (in nominal values). Finally, it’s important to keep in mind how fast and rapidly farm delinquencies can change. For example, from 2008 to 2009 delinquencies of farm non-real estate loans increased from 1.48% (in the forth-quarter of 2008) to 3.15%; increasing 1.67 percentage points or more than doubling. With that said, it is important to monitor and observed these data frequently. Given the economic conditions in the sector one would expect that delinquencies will rise. Finally, concerns about farm debt repayment will continue as net farm incomes as expected lower again in 2016, farm debts continues to pile one, and farm interest rates also continue higher. We will visit these issues in future posts.